Specially for children ages 5-7. 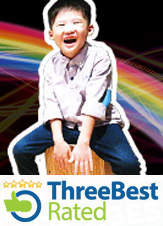 This school holiday, experience the thrill and passion of playing the CAJON for real. Following Believer Music's innovative and revolutionary approach to music learning, your child will play this instrument with purpose and focus. Team dynamics will encourage each child to actively collaborate with others to make music as a team. The drumming exercises will also foster better concentration, listening ability, communication skills, and develop both fine and gross motor skills. This 3-week module will inspire your child to engage joyfully with the pulsations of music. The nature of playing the Cajon will, most importantly, awaken and set them on a life-long path after God’s heart. Thematic Devotion: THE AWAKENING Discover meaning, purpose, and restoration, as you awaken to God's will for your life. We accept registrations from ages 5 to 7 only. The lessons will focus on developing gross motor skills in your child. At this age, it is important to cultivate discipline and consistency in rhythm playing. The ability to maintain a steady rhythm translates to many other physical and emotional benefits in a child’s growing years.